And then there are some that are just plain cool. Cobalt is just really neat. Part of it is the history. Part of it is the town’s independent streak. But mostly, it’s just so old and, well, old, that it’s really interesting. My first impression of Cobalt was “oh god.” And not in a good way. But boy was I wrong. 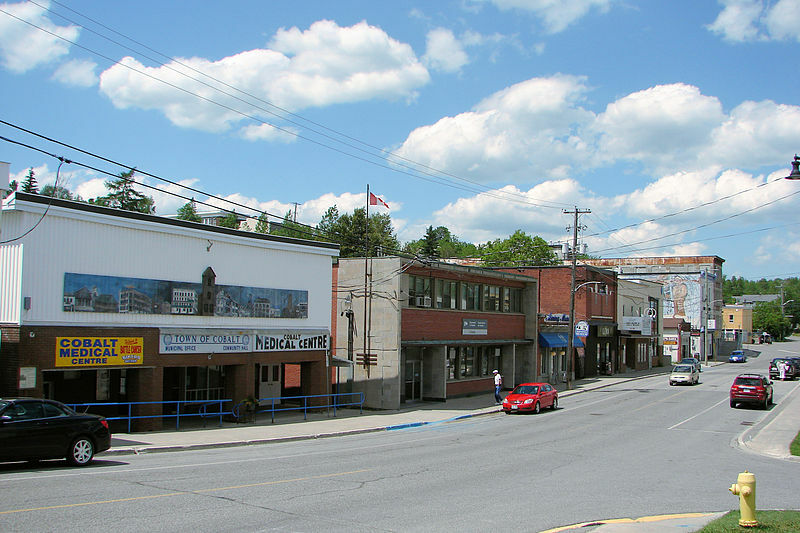 Cobalt is the kind of town that would have five taverns but no grocery store. And that’s what makes it so interesting. It was when I stopped to take a break from driving that I really saw my surroundings. I realized that what looked old and run down was simply historic. That was looked grotty and old really had a tonne of character. 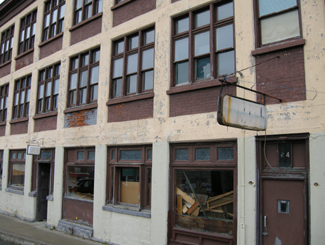 That instead of tearing down older buildings and erecting cheap, shoddy new ones in their place, Cobalt had preserved its history. A history they were proud of. This place wasn’t run down, it was preserved. Cobalt was named Ontario’s most historic town for a reason. Sure, there aren’t a tonne of stores or boutiques. But at least there aren’t a tonne of places selling crap either. There is no grocery store left in town (it closed in 1992 when the store owner cleared out the remaining products and held dance parties in the store to commemorate its closing), but what else is there is because it needs to be there – like museums, mine shafts, and bars. More than a few of them. The Highway Book Shop was a classic tourist destination that never feels like a tourist destination. 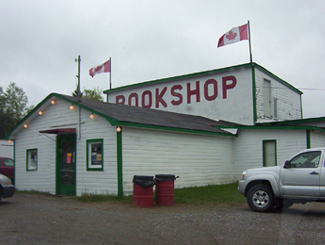 It was a family-run used bookshop on Highway 11 just outside of Cobalt and it is not only worth a visit, it is worth some time. Maps, books, magazines, teaching materials, kid’s lit, old books, new books, big books, rare books – you wouldn’t have believed all the crap they have in there. I think I spent an hour on two separate occasions perusing the cramped store. It might smell like your grandmother’s basement, but it’s really neat, and no visit to Temiskaming is complete without a stop, in my opinion. Sadly, the icon has closed. Ready to retire for years, the owners couldn’t find anyone to take the store on and had to shut one of Highway 11′s best attractions down. Cobalt Classic Theatre is the only remaining theatre from Cobalt’s heyday in 1920s. While other towns were using economic development funds to build golf courses, Cobalt restored the old Classic Theatre in 1993 and now hosts students, playwrights, and actors from across Ontario. The theatre is restored to what it looked like in the 1920s and is a focal point for the community. 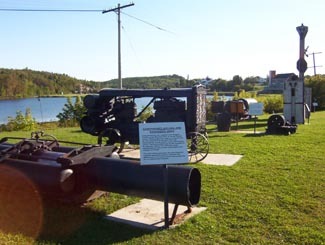 Antique mining equipment on display at the lakefront. Other towns would have just thrown this stuff out. Cobalt, refreshingly, doesn’t run from its roots. This headframe is now the world’s only bar in a mine headframe! That’s revitalization, northern Ontario style. The Cobalt Mining Museum has the world’s largest display of silver and offers the only underground mine tour that I’ve seen outside of Timmins. The Bunker Military Museum has a good collection of memorabilia, the Great Canadian Mine show displays mining technology, and there is also a firefighter museum in town. Cobalt also has two separate self-guided walks. 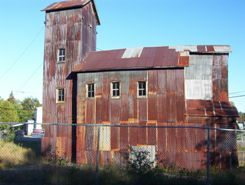 The Cobalt Walking Tour brings you through town past historic buildings and historical places, while the Heritage Silver Trail is a self guided tour of many of the abandoned mine headframes in the area. There’s more. 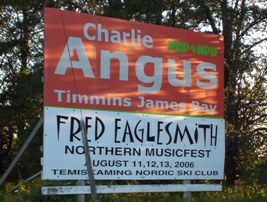 There is Fred’s Northern Picnic, an annual music festival that the local Member of Parliament usually plays at (he’s a musician by trade) and where you get three days of music and free camping for like $60. The Silver Street Cafe has good food and decent prices, and they also cater local events with real food (forget hamburgers and hot dogs, think steak on a bun and pulled pork with onions.) The Silverland Inn and Motel is a restored hotel from Cobalt’s mining heyday and also serves food. There is a stained glass shop, a gem shop, and Iddy Biddy Petting Farm. 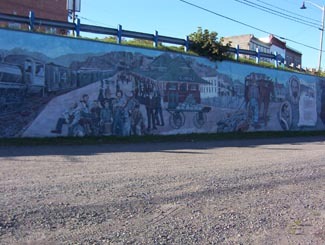 Cobalt also has more murals than Nipigon. I read in the James Bay tourist brochure that there is a legend that Cobalt blacksmith Fred Larose threw his hammer at a fox, uncovering a rich vein of silver in the process. Further silver and mineral deposits were found in 1903, triggering a mining rush like no other in northern Ontario. The significance of the Cobalt finds supposedly led to riots over mining stocks in New York City. Others say that Cobalt built Bay Street (Toronto’s Wall Street.) A testament to the town’s wealth, the Cobalt Silver Kings played the 1909 season in the NHA, the NHL’s precursor. 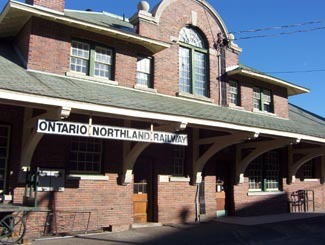 Another first in Cobalt include the Temiskaming Streetcar Line, which was installed between Cobalt and Haileybury, and was the first streetcar system north of Toronto. In addition, the mines of Cobalt built Casa Loma, the famous “castle” built upon Spadina Heights in Toronto. Sir Henry Mill Pellatt was a wealthy Canadian mine owner (some say Canada’s richest man at the time.) It was his mining operations in Cobalt that allowed him to gather the immense wealth to build Casa Loma. Construction began in 1911 and took more than three years, 3.5$ million, and more than 300 full-time workers. With 98 rooms, it was the largest residence in Canada at the time. Pellat eventually lost his residence, as the Depression and the decline of mining in Cobalt led to his financial ruin. Casa Loma was essentially built with the revenues Sir Henry Mill Pellatt gained by draining Cobalt Lake for silver mining. The Cobalt rush eventually produced more than $260 million worth of silver, countless myths and stories about how and where silver was found, who struck it rich, and who lost their pants in speculation. 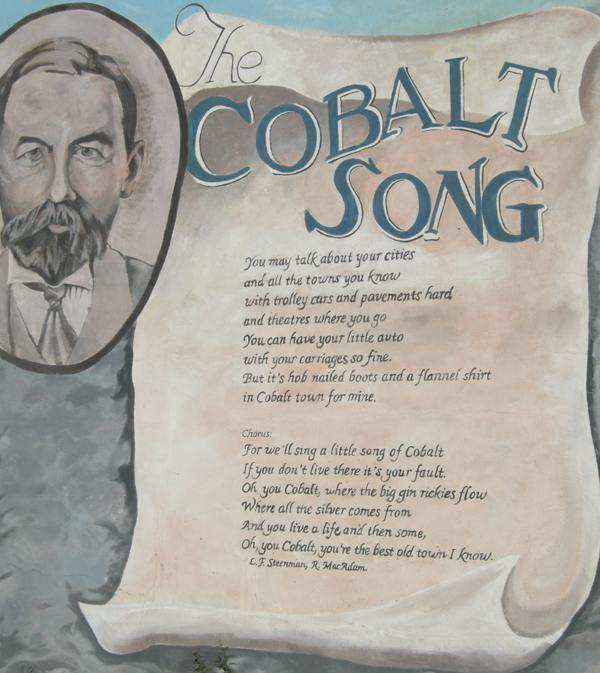 The Cobalt silver rush resulted in a whole little Cobalt culture developing – embodied by the Cobalt Song (click here to download the sheet music.) Cobalt led to the founding towns like North Cobalt (a bedroom town for miners) and Haileybury (a bedroom town for wealthy mine owners.) The mining boom in Cobalt also paved the way for exploration further north, which led to massive gold finds in Timmins and Kirkland Lake, both of which far exceeded the value of the mines of Cobalt in the long-run. 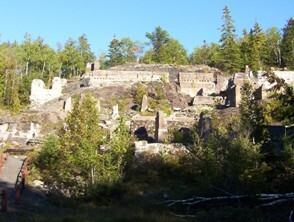 Although Cobalt survived the usual northern Ontario disasters, including a typhoid outbreak in 1909, and Great Fire of 1922, it couldn’t survive the decline of mining. Well, it survived, but it’s much smaller today and mining no longer exists. There is some exploration for diamonds, but I don’t think they’ve been found. I’ve heard that many of the old mines still have minerals in them, but that it’s just not economical to mine such old shafts for minerals at today’s prices. But, in the end, the history of Cobalt is one of a town that conbtinually gets kicked, but then manages to find its way back up. 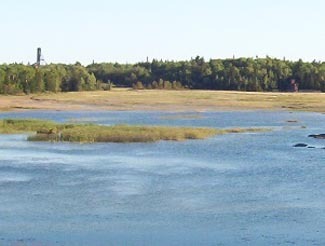 Cobalt is considered the third part of the Tri Towns along with New Liskeard and Haileybury. But for some reason it didn’t amalgamate into Temiskaming Shores in the late 1990s when the province forced municipalities to squish together. Maybe it’s too far away. Maybe old hostilities with North Cobalt scuppered a move. Maybe the town is too independent. Maybe there is still an old hockey rivalry between Cobalt and Haileybury from the one season both towns had a team in the NHA. I’m sure someone in the town of 1200 put up a fight. I don’t know. I haven’t spent as much time as I would like in Cobalt, and, I must admit, haven’t visited any of the touristy things here other than the Highway Book Shop. But I’m sure I’ll be back again. This entry was posted in Temiskaming and tagged a&e, festivals, great fires, hiking, hockey, mining, murals by Highway11.ca Editor. Bookmark the permalink. We lived at 99 Cobalt street Read Book “At Your Age” two great short stories about Cobalt. Book available at the Veranda Bracebridge ON. Born & brought up in Haileybury /lived in Kirkland Lake in my elementary school years. My maternal grandparents The Hurst family lived at mileage 104. My families homestead was on Meridian Ave. in Haileybury. Liam..I understand you were great friends of my aunt Irenes. Cheers to all the northeners. My grandmother was born in Cobalt her last name was Gemus I’m doing my family history looking for any records or stories would much appreciate the help. About 9 or 10 years ago or so, I had to travel up to Timmins to help set up the new Home Depot being built. I stopped at the Cobalt Truck Stop for lunch, and while it place looked nothing spectacular, the food certainly was. For $10 I had a delicious steak smothered in this yummy peppercorn sauce, these potatoes that were so light and crispy, and a green garden salad. I had a coffee with it, and the lady sent me on my way with a free refill for the road. I remember the stop very vividly. The lady working asked what sort of truck I drive, I had to tell her sadly it was just a station wagon I was in lol. I haven’t been by there since, so I don’t know if the place is still operating. I grew up in Cobalt somewhere between 1950 to about 1955. My father used to work at the Silver Miller mines. 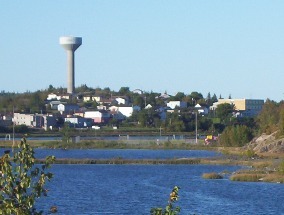 We used to live in a 2 story house on the edge of Cobalt Lake directly across from the railway station. I remember as a kid the train going by every night at about 7 PM. Also in the winter time I would always wait to see foot tracks across the frozen lake which was a sign that it was now safe to walk across that lake. A real short cut to town. Behind our house, up over the hill was a place we called the “slimes”, old mine ruins. They were our playground then. We had lots of fun in and around the mountainous areas of Cobalt. Lots of swimming at Bass Lake, Sas Lake, Pike’s Lake. Lots of childhood memories of Cobalt, the best old town I know! My great grandfather Alfred James Young had some mine ownership in Cobalt. He was based in North Bay. Hope to visit some day. That was a great article. It bought back a lot of memories. I was born and raised in Cobalt. I worked two summers for Silverhills Mines. I went back to Cabalt a few years ago and took my girlfriend with me. We decided to take the self tour that one can take that takes you through the the old sites. What struck me was that a good portion of the tour was my old playground. We would snowshoe across the lake in the winter, bike around in the summer. The old mine ruins were great for young boys playing war. We always played around the old headframes and concrete ruins. It’s surprising kids weren’t killed playing around there. I am sure many remember walking along the pipline over the open cut going to Sass lake. In the mid seventies that town got the best bands in . If you weren’t at The Fraser House early you couldn’t get a seat. Hats off to one of the best towns one could come from. That’s awesome. Your first was in a mine? That’s so northern Ontario. Thanks for posting. One thing that no-one has mentioned is The Bunker Military Museum in Cobalt!! Jim Jones, a local, started to collect military memorabilia after returning from WW2 and his collection, now owned by the Museum’s Board of Directors, of approx. 15,000 artifacts, is displayed in a quality museum on Silver Street. It is one of the few multi-national Military Museums in Canada. Honouring Jim, who passed away in 2007, the museum’s motto is “Not to glorify war, But to kindle fond memories”. A tour of the museum is very unique experience!! I grew up in Cobalt and nearby New Liskeard. The photo above of the headframe with the caption stating it now has a bar in it was our home. Mom and Dad owned the building which had two apartments upstairs and two retail spaces below. We lived in one apartment and directly below my father had a butcher shop. It was called Red’s Fancy Meats. I have worked in the mining industry for some 25 years now and have recently accepted a position with a mining company that will mine on Baffin Island. The deposit on Baffin Island was discovered by long time Cobalt resident Murray Watts. Small world. As I write this, I am IN the old headframe, and the bar is long gone. 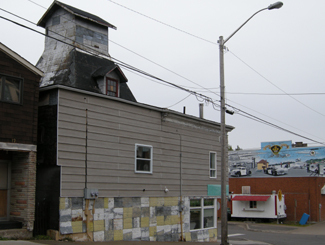 There’s still 2 apartments upstairs, but as of Aug 2014 downstairs in the headframe is the new home of White Mountain Books. Highway Book Shop closed in 2011, so that part of the blog is a bit out of date. Stop in and see us sometime. Used to hitchhike from New Liskeard 1960+/- to Cobalt to play snooker-good tables, not too crowded. My grandfather owned a mens clothing store in Cobalt in the early years, but not sure exactly when. Can anyone give me a lead as to how I might track the date down i.e.newspaper etc. re: william john brennan…i have copy of newpaper clipping… put in paper one year after william died….can send u a copy if you like…..also have one photo of him….can send u copy of that too.. I am related to the Dagenais/Morin of Cobalt. I am avidly doing my family tree & history. If anyone out there has stories, info or whatever….please get ahold of me. My parents owned the Cobalt Truckstop (directly across from The Highway Bookshop) from the late 1960′s until the mid 1970′s and I was born in the Haileybury Hospital in 1972. I grew up on the stories my parents had of the wonderful people and of the area and am proud to be from such a unique and super cool place! I will be heading up to pay the first visit of my adulthood this coming weekend and cannot wait to explore the area. Looking for information on the Cobalt newspaper that was there in August 1939. My great uncle William John Brennan was hit by a car and left to die in ditch. We are looking for the newspaper article in order to add it to our family records. We are looking to see if the driver came forward. My email address is malcolmxl@sympatico.ca and William is buried at the St Theresa Cemetary in CObalt. He died August 20th 1939. Someone mentioned the Temiskaming Speaker. Just found that I have a relative from Scotland who arrived in Cobalt and worked in a bank there in June 1910 before a short time later catching and dying from Typhoid on 12th September 1910, if anyone knows of where to possibly find a grave or know of local records I would be grateful for the information, his name was John Bain and died aged just 19. At :http://freepages.genealogy.rootsweb.ancestry.com/~murrayp/ you will find the Northern Ontario Gravemarker Gallery. Under Temiskaming, Bucke Township, Farr Historic Cemetery there is a William Bain aged 19 yrs. 9mos from Paisley Scotland who died on Sept. 10, 1910. This may be your relative. Have you been up to Temiskaming lately? Cobalt has changed dramatically since you wrote the Cobalt article. I have some new photos if you care to use them. I am doing some extensive writing mapping and illustration on Cobalt at the present. I work with the archaeologist who completed the Stage 1, mine site archaeological study. I’ve always enjoyed your highway 11 site. My Grandfather, Frank Richardson was the first blacksmith in northern Ontario. He was in Cobalt and made mine drill bits in a blacksmith shop under his house. The shop opened on to an alleyway. I think he lived on Cobalt Street, but I can\’t remember. I spent time during my summer vacation in Cobalt and remember it lovingly. When my father, Ralph Richardson passed away in Mississauga, Ont., we had the organist play The Cobalt Song during his funeral. He would have been so proud. I lived at 53 cobalt st.
. My family moved in around 1964 or so. I delivered news papers to your Grand father and gramma too of course, for years. I also attended te same church as he did Cobalt United Church. Very nice couple. I was born and raised in Cobalt. As a kid, I explored all of the mining head frames, sometimes being chased away by police. LOL There were places we discovered as kids that no one would advertize, including a hole in the ground that led to an old mine that was easily accessed by anyone who knew how to find it. Cobalt definately has history, and I couldn’t think of a better place to grow up. The booming days might have been well over by my time, but to me it was always booming as a child. The Miner’s Festival was always a treasured event. As the saying goes….come for a day, discover a century. I proposed to my wife in one of the adits (no. 4), so we have very fond memories of the place. This is a very cool town, though you do get the feeling that the “better days” happened before most current residents’ granparents were alive. At the same time, the place oozes history. 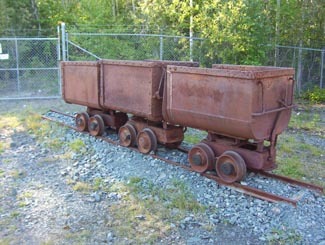 Check out the mining museum and definitely go on a tour. I was amazed to find out that in the early days of mining, something like 40% of the miners died in some pretty horrible situations. I will never complain about work again. These guys were the real thing. It makes you realise how far we’ve come, and how brutal the working conditions in Ontario were for some people even up to the start of WW II.